Creating Curb Appeal: To some the idea of a “street” look would be a ball cap, low cut jeans with one leg rolled up and some added bling. That is not what we are talking about at all. My idea of “street” look is the way your house looks from the street view. 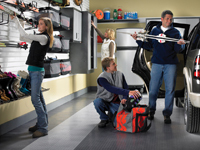 With design, the goal is to ensure that the items in your home work together visually. The same should be true of the street and the neighbours you live around. You have opportunities to express yourself in details but the overall colour should be relatively neutral with strokes of the dramatic. 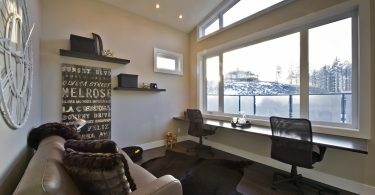 Given the sunshine light quality in Canada, we generally need to stick to neutrals like grey, warm taupe, off white and muted pastel colours. Bright colours (blues, pinks, greens, etc) are better suited to tropical climates where the sun is far more intense. I called this look the “Chanel – Simple Dress Look”. The colour scheme is classic and timeless with Apex windows from All Weather Windows using Renolit EXOFOL-FX colour technology in Black. This new colour technology creates a bold, durable colour that will hold up to harsh Canadian weather for years to come. I combined the black windows with scales of grey in the shingles, porch floor and details. 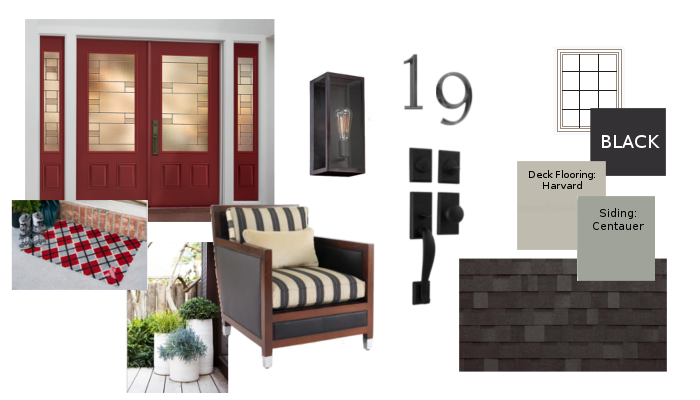 The elements of black in the porch lighting with Edison bulbs combined with hints of red in the welcome mat and front door and wood tone on the porch furniture. The white planters on either side of the porch steps focus the attention on the entrance while playing with the white stripe of the chairs.